For the second time in this early season Rhea County bested the Trojans again, this time in their own gym. The Lady Trojans were wounded missing a couple key players. Coach Gill began to show mercy as his Lady Eagles were up by more then 20 points at the end of the first quarter. For the rest of the game Lady Eagles did hockey line subbing with 5 players coming in and 5 players coming out on a rotation. As the continuous clock ran out it was the Lady Eagles who walked away with great ease of 65-26. Micah Black had 18 points and Mallory Hampton had 14 points. The Eagles faced off afterwards. The Eagles are coming off a hard list to Cleveland standouts a few nights before hand. The Eagles and the Trojans battled hard for the upper hand. Rhea County held a small lead through the entire first half even though they were struggling getting shots to fall. Early in the second half the Trojans got hot band started to get some open looks form the three point line. Feeding from those students section and bench Soddy Daisy turn the tables on the Eagles and took the lead into the fourth. Like many times before Senior leader Spencer Robinson helped lead his Eagles back into the game along with big defensive hustle plays by his teammates. Late in the fourth though it was Matthew Levi who knocked down some key threes that help seal the deal for the Eagles that gave them the second victory 54-50 over Soddy Daisy for the season. 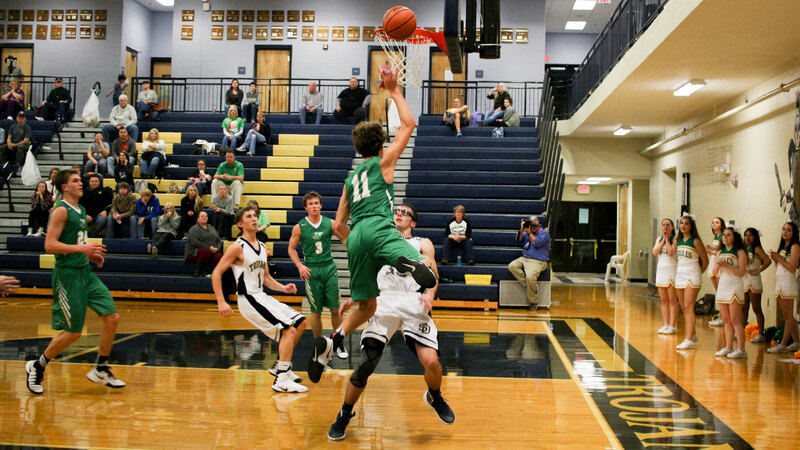 Spencer led the Eagles with 16 points, and Bryson “The Flash” Bales added 11 points.